Today, in the twenty-first century the leading causes of death are the degenerative diseases such as heart disease, stroke, high blood pressure, diabetes, and cancer. 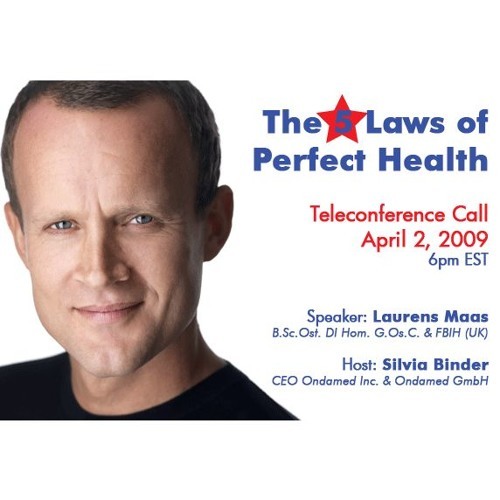 Over many years of research, confirmed by the successful treatment of patients at his Barbados clinic, Laurens Maas has been able to observe common threads in diseases and over time has researched and formulated The 5 Laws of Perfect Health. The research is based on many clinical observations from many top medical doctors, physicists, and other scientists in the past and present. Laurens, as an osteopath and homeopath, has witnessed similar professional clinical observations and results. With a different holistic vision, Laurens has braided together five key medical theories, based on science and scripture, to create a healthful lifestyle that encourages longevity and freedom from disease. The plain, simple truth is our internal and external environments have been damaged by our overuse of antibiotics, yeast extracts, and sugar both in humans and their animals, especially those sent to slaughter for human consumption. The food chain is contaminated with fungal product residues. "ONDAMED is one of the most modern machines currently on the market. ONDAMED uses the latest technology for outputting harmonic PEMF... The theory behind the ONDAMED system is based on biophysics and quantum theory."